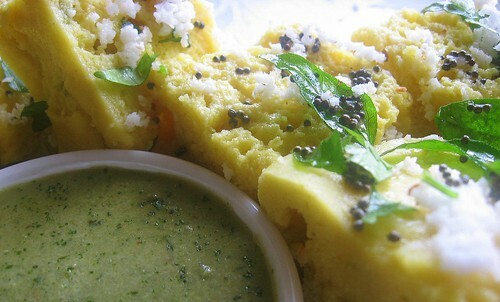 Indian Cooking Challenge - Khaman Dhokla ~ The Authentic Way!.. Khaman Dhokla - A delicacy which I had always to try, being postponed just because of failing to get a perfect recipe and lack of confidence :)..
Well, I am extremely glad about the best outcome with Srivalli’s Indian Cooking Challenge for the month of July-09. 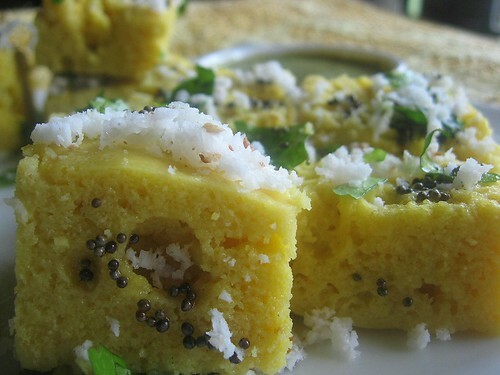 I enjoyed taking up the challenge, immensely and here is the recipe for Khaman Dhokla , guaranteed to success ;).. Mix first the curds with water. Start with ½ cup of water.Since I used lime juice I had to be careful here.To this add the besan and mix well to get a lump less batter.The consistency should be like of idli batter, more of dropping, not pouring consistency. Slowly add more water if needed else, add the soda. Keep it aside to rise for 1 hour. 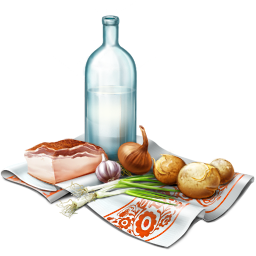 Place a large vessel or pressure cooker with about 3 cups water on the stove top to heat. Grease a round pan or a pressure cooker insert vessel. Meanwhile have the pan on stove, and let the water start boiling. When the water reaches the rolling stage, you can mix the eno to the batter (remember to save little of eno for dusting on the plate), mix gently, you will see bubbles coming out, the batter turning frothy and light. Dust or sprinkle the plate with eno. Immediately pour the batter to the plate. Place the plate carefully inside the pressure pan and cover with lid. Cover the cooker with its lid now.You need not use the whistle. Wait until you get a forceful jet of steam.Keep undisturbed for 5-7 minutes. The batter should be filled to only 1/2 as it will rise up. After adding eno, the batter should not rest. Amount of sugar can be increased on preference. Remove the lid and proof it using toothpick or knife. If the knife comes out clean, it’s done. Cover back and let it remain on flame for another minute and switch off the gas.Let stand for 5 more minutes. The total time taken is 20-25 minutes. In a bowl, mix 2 tsps of water along with a tsp of oil. Open the lids. Remove the cooked dhokla from the pan carefully. Sprinkle the oil-water mix as soon as you take out the dhoklas as they tend to be a little dry. 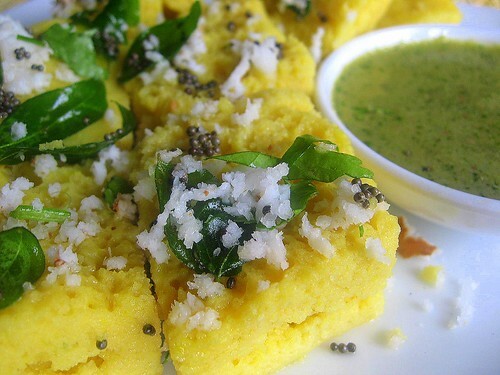 For seasoning, heat a pan with oil, pop mustard seeds, add sesame seeds, finely chopped green chilies and curry leaves in order, pour over the dhokla. Garnish using finely chopped coriander leaves. If you want perfect shaped ones and not the crumbly squares, cut and handle gently. Serve warm with Green Chutney. Grind all the ingredients except coriander in a food processor. Grind to a smooth paste. Add the coriander and grind again. Remove to a bowl, add the remaining lime and serve with warm Dhoklas. The changes I made from the original recipe. A levelled 200 ml cup of besan instead of 1 & 1/2 cups. Reserved 2-3 fat pinces of Eno from the same sachet for the purpose of dusting. Cooked the dhoklas just like steaming up idlies, the traditional way,with the boiling water rolling down in the pan and dhokla in idly moulds, proving to be the best and hassle free method; got cooked in 12-15 minutes. Along with the thadka, I added a tbsp of “Hot” water + a tsp of sugar mixed together for a sweetish finish, before pouring over to the dhoklas. The above claims to be the original and authentic recipe for making Khaman Dhoklas.The recipe seems to be quite elaborate and complicated but easy to make, once the ingredients are set :) !! The best and the easiest method to prepare ‘Jhatpat’/ ‘instant’ Khaman Dhoklas which I had tried and tested along with the authentic is here and here. Chammanthi podi, a fine medley of roasted coconut and spices, is a common preserve in Keralite homes. Each home has its own variations. Tamarind-a fat one inch piece; pinched to smalled bits. Heat a broad and wide iron wok.Do NOT use even A DROP of OIL. 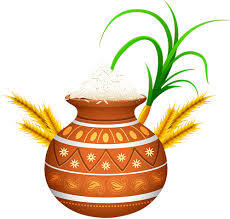 Dry fry, coconut until the moisture in it evaporates and turns the colour into mild brown. Cool and pulse twice for not more than 2 secs . We do this, for even frying later, as this brings the powder to even particles. Freshly grated coconut, while getting fried doesn't brown equally. Hence this step. Tranfer all the ingredients with pulsed coconut, to the wok stirring all the time in slow-medium flame,evently. Fry until the coconut gets a deep brown hue and the roasted coconut-spice aroma spreads around.This will take around 25 minutes. Cool and powder.Add tamarind and check salt.Pulse/grind again.See to it, you don’t throw in the tamarind piece before you powder the mix in the first stage.Let the Chammanthipodi be a little coarse, coz that’s the way it has to be ;).Store in airtight-glass bottles.The powder has a high shelf life and stays well for a month in room temperature and stays better in fridge/freezer compartments. The Authentic Chammanthi Podi calls for a tsp of finely minced ginger, a few cumin seeds and a tbsp of minced shallots in addition to the above mentioned ingredients.I generally avoid these 3, as I personally feel they would bring down the fine roasted "coconut-spice-curry leaf" flavour. You can skip the pulsing part in the first step, if you use dessicated or store bought coconut or if the particles are even sized. I badly need to admit something, honestly.. I prefer cooking as an ‘Art’, something creative, something traditional, a delicacy or may be something presented in a stylish way. ...but definitely not to tire myself one after the other the whole day, whipping something up in a hurry burry way meant for breakfast, children hurrying to reach school on time and V to office…and a sumptuous lunch prepared with fullest effort mostly going “Unrelished”or “Untouched”, failing to be have had on time or even if ; in a hurried way. ...then comes the 'mighty' Dinner time; chidren having the same, watching TV / fighting / (the Tom & Jerry way) and V having it as a part of some ‘nightwalking’, after 12 midnight, better explained as a wee hour breakfast..
Those are the normal weekday scenarios. 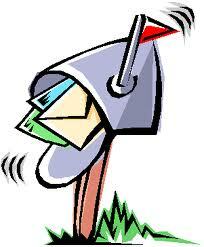 "Then why on earth do you need to blog, wasting the much wanted Cyber space?" Let the Pictures Speak :)..
My Sister gave a helping hand to finish this hand painted saree..